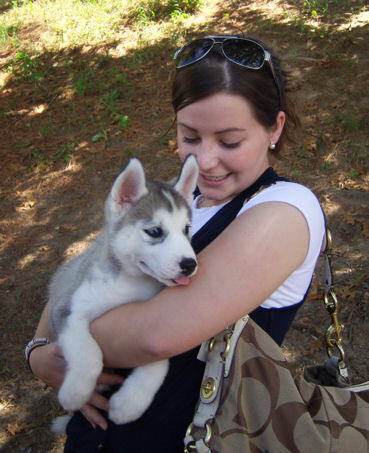 Our Siberian Huskies have become new family members in many homes across the continental United States and one is a proud member of the United States Armed Forces . His duty is that of an aid in rehabilitating US Military Service Members. We have several others who have become members of the Marines, Navy and the US Air Force. We have also shared our sibe family around the world and some of them now live in Scotland, Canada, Hawaii, Japan and Mexico. 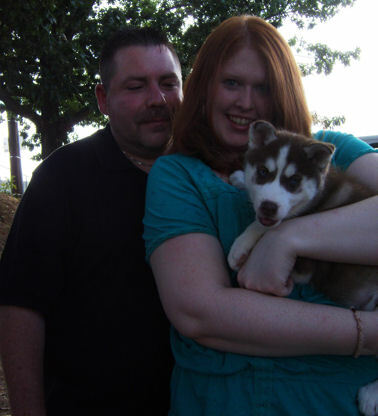 This page will showcase some of our proud new Sibe owners. Here you can view photos and read testimonials of Cafitachiqui's wonderful sibes and their new families. Enjoy! leaves my side. I love her. 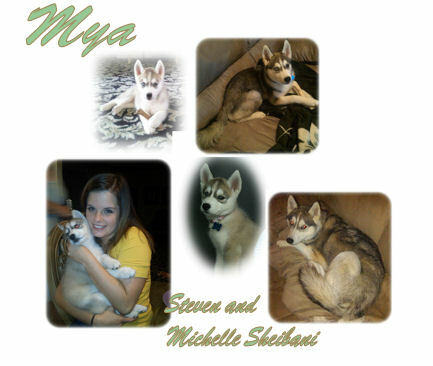 Steven and Michelle Sheibani sent us these photos of their growing little sibe girl who they named Mya. We appreciate the updated photos featuring all our little treasures from Cafitachiqui. Hi, it's been awhile so I thought I would send you some new pictures of LIL Blaze. I am in Iraq and he has been giving my wife fits with his chewing. 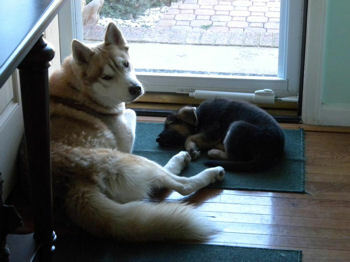 For christmas I bought her a German Sheperd puppy and Blaze has changed alot since then, he has taken to the role of playing dad to the puppy and he is doing so much better now. His favorite place to lay is right in front of the storm door so he can watch what is goin on outside. At his one year vet check, he weighed 54 lbs. Depending on the lighting, his color goes from a tan-ish grey to a red. Yes he is spoiled, just like the rest of our dogs are. 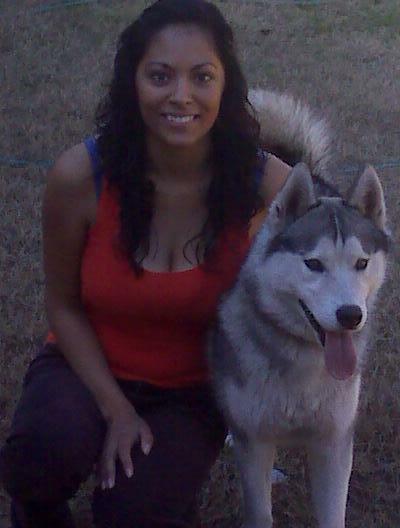 Again thank you for Blaze, he is such a beautiful dog. We want to thank you Tim for the updated photos of this beautiful boy who we knew would grow up to be one big fellow. It is obvious Lil Blaze is not so little anymore but it is equally obvious that he looks just like his namesake, Blazer. 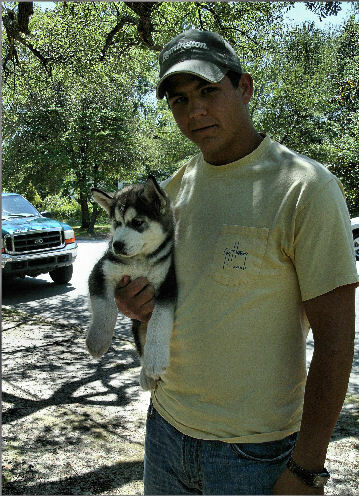 Mason and his new boy Kyokee. with handsome new blue-eyed companion. Our fat little copper girl Kizzy, renamed Lyra, with her new and obviously happy companions John and Audrea Mixson. It's amazing how some things just go together naturally like a lucky man with two beautiful fiery red heads. Thanks John and Audrea for providing us upates on this beautiful red girl of Cafitachiqui. Hello, this is Linda Boling. 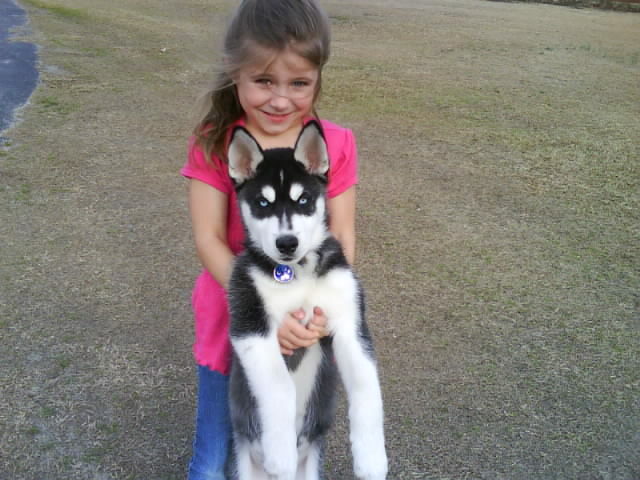 My daughter Caitlin, bought one of your wonderful puppies this last December. 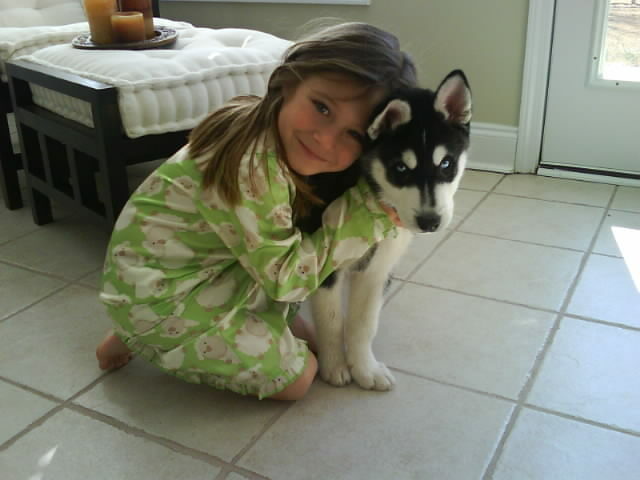 You have her picture on your web-site as the girl with the green sweatshirt and the black-white female puppy. I just wanted to let you know that the puppy (we call her Bella) has been a joy to have. Her temperment and intellegence is astounding! I think that she believes she is just "family". 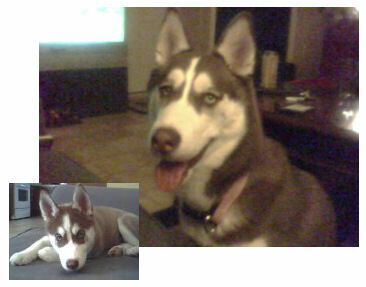 I am sending you some photos just to show just how much we love her and how she has grown into such a beautiful dog. Baby girl Bella (previously Cafitachiqui's little Angel) at left. Thank-you for raising such sweet tempered dogs, they are a joy to have around ! Above blue-eyed Bella in the Snow January 2009 and right Bella, now a teen pup, at Surfside Beach South Carolina summer 2009. Photos courtesy of Linda Boling. 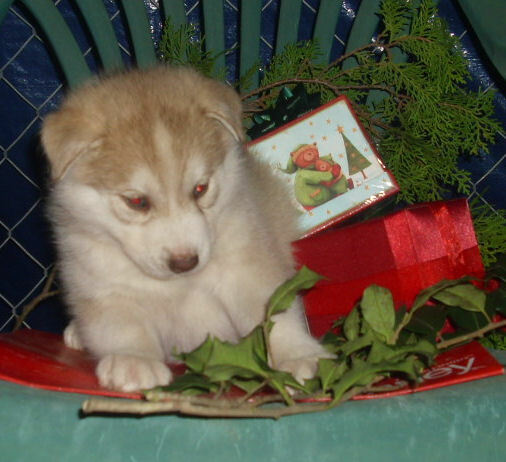 Thanks Linda from Cafitachiqui for sending us these photos, for your kind sentiment above and for your great care of one of our Siberian Husky baby that is now a member of your loving family! The sweet look of innocent love. 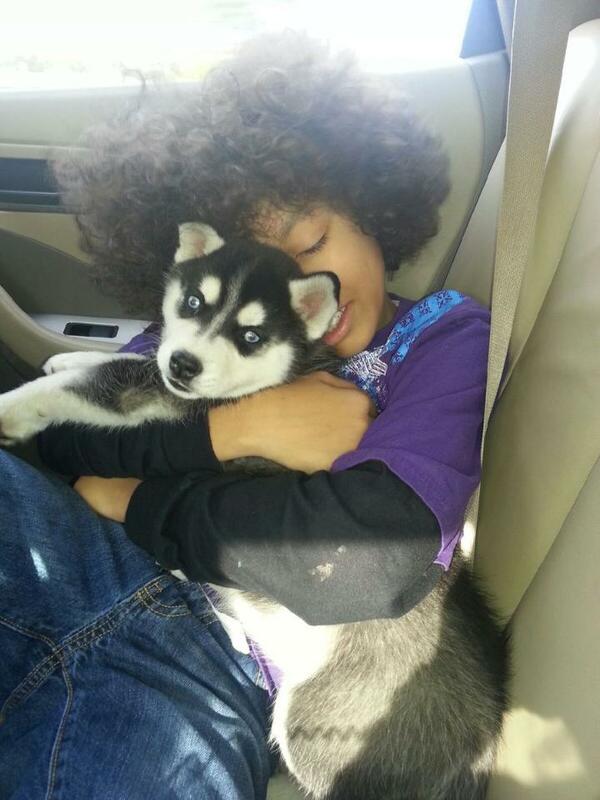 This is Logan with Nanook. 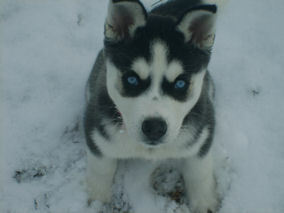 This handsome black & white, blue-eyed boy was from our winter 2008 litter. Thanks Skip for sending us these photos of your baby with our baby. They are both so photogenic. Jango went to the vet this week he is 17lbs . . . they all fell in love with him, he has learned to sit and to shake we are teaching him to stay now. He loves the freezer, everytime we open it he crawls in so mom cleared out the bottom shelf so he can sit for a minute - he loves all the kids that come by and is growing so fast. I'll send a picture of him in the freezer. 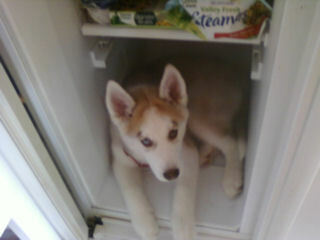 Jango in the freezer . . . sooooo cute! "Hi. Betty. How are you? We are so happy to have Camden. 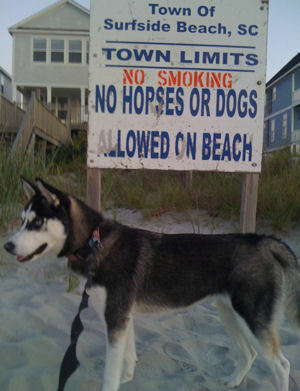 He is such a nice dog." 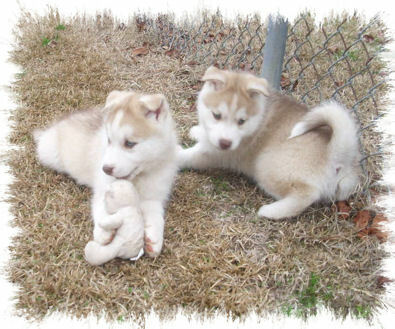 This little blue-eyed AKC boy to the left is now named North Star Camden. 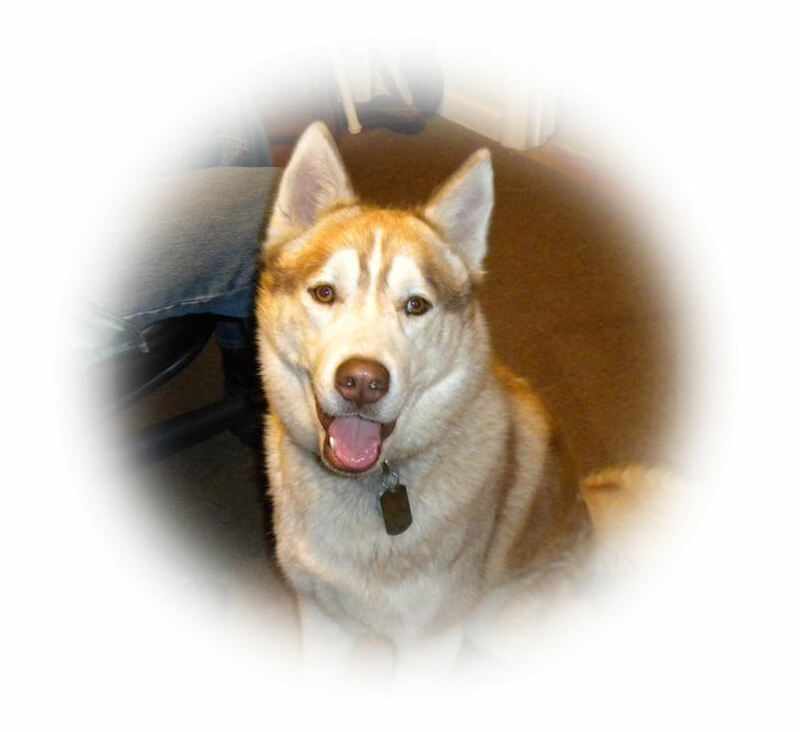 Camden has recently found a wonderful home in Greer, SC with Curtis and Judy Piper who have provided us some updated photos of this handsome sibe. Thanks Curtis and Judy for the updates. 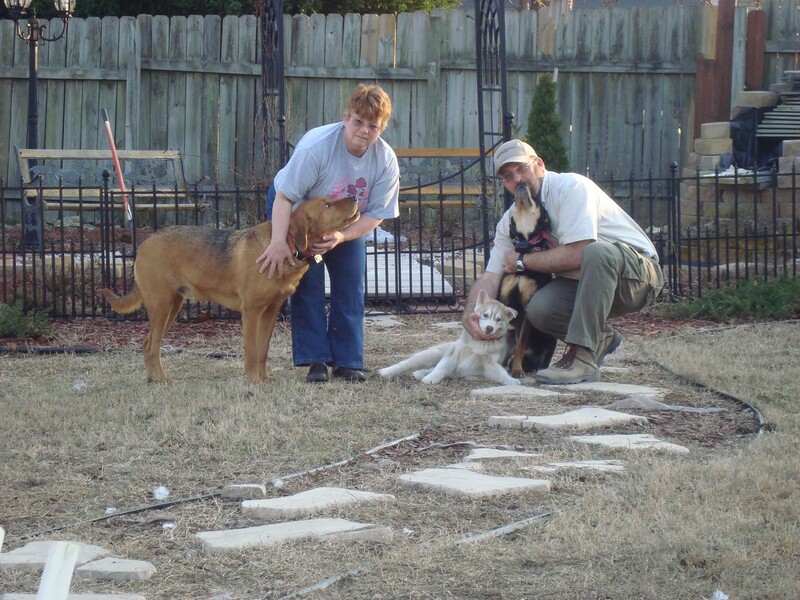 Our handsome gray male Zack above and at right with his new mommy Jazmine going home to Greenville, SC. He was a member of the wedding party at her wedding to Jordan White. 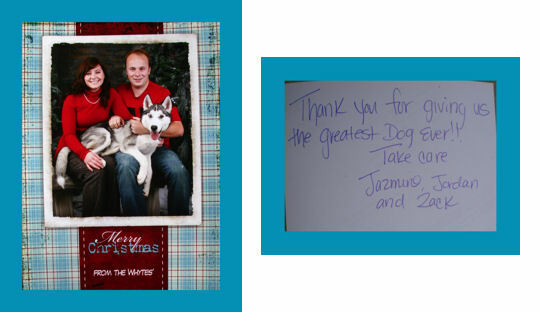 Zach, Jordan and Jazmine are a wonderful happy new family trio. 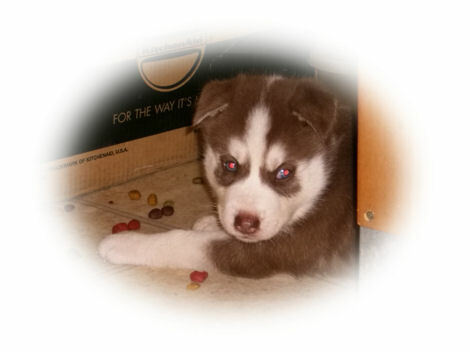 Cafitachiqui thanks you for your updates and photos of this beautiful growing male from our sibe family to yours. We love the Christmas card photo of the three of you that you mailed to us over the holiday. As his name implies, Apache has grown to be the epitome of his natural heritage. This large male with an open white face and symmetrical markings that enhance the beauty of his wolf-like eyes displays the character of his Monadnock heritage which is clearly visible. His coat is a beautiful blend of charcoal and silver gray with white. Apache is Martha's beloved companion. Thanks Martha for sharing this photo with us of you and one of Cafitachiqui's beautiful males, Apache. 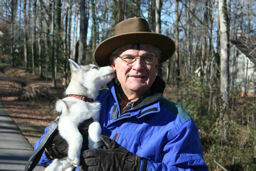 Athena has found a new home in Georgia as a young man`s Christmas dream come true .